Ooltewah High School's marching band is one of 24 bands nationwide chosen to march in the McDonald's Thanksgiving Day Parade in Chicago. * Appearance: McDonald's Thanksgiving Day Parade in Chicago on Thursday, Nov. 22. * Televised: 9 a.m.-noon on WGN (Comcast cable 2). * Traveling: 75 students, 40 parents/chaperones. * Show: "Chicago is known as the Midwest train hub, and it also was the second city of jazz when jazz moved from New Orleans after World War I," said Denton. "We'll play 'Take the A Train' with a hint of 'Chattanooga Choo-Choo' and a hint of 'Jingle Bells' -- a salute to Chicago with a snippet of our hometown and of Christmas." * Cost: $850, includes accommodations, meals, a dinner/dance, Thanksgiving dinner aboard The Spirit of Chicago in Lake Michigan, a performance of "Les Miserables," dinner at Union Station, Black Friday shopping, ice skating at Millennium Park and a performance of the Chicago Symphony playing the soundtrack of "Fantasia" while the movie is shown on the big screen in Symphony Hall. "When we travel, it should be a once-in-a-lifetime experience for the kids, because a lot of them will never get this opportunity again," said Denton. * Director's quote: "It's a great honor to get to do this parade. It's a fantastic opportunity for us because, with an appearance in the Macy's Thanksgiving Day Parade next year and the Walt Disney World Christmas Parade last year, that will be three years in a row we've been on TV in major holiday events," said Denton. * Director: Alan Hunt, with assistant directors Colby Burris and Donald Benton. * Appearance: London New Year's Parade, a 2-mile route that passes by Piccadilly Circus, Waterloo Place, Trafalgar Square, Whitehall before concluding at Parliament Street. More than 10,000 performers representing 20 countries will march in the parade, according to its website. * Televised: Live satellite coverage beamed to 700 outlets, among them CNN, Fox News and CBS. * Traveling: 80 students, 70 parents/chaperones. "We try to take a big trip every three years," said Burris. Since the band marched in the London 2010 parade, taking almost 300 students and chaperones to England, this trip was opened up to 80 band members who wanted to go. * Show: "Gangnam Style" with choreography. * Cost: $3,250, includes meals, accommodations and sight-seeing fees. * Director's quote: "This is our fourth time to go to England. They run this parade so well, the kids love it. It's awesome," said Burris. * Appearance: Noon-3 p.m. today in New York City Veterans Day Parade, sponsored by the United War Veterans Council. Parade theme is "United We Stand." * Televised: Shown on MyNetwork TV in 10 major U.S. cities, none local. * Traveling: 130 students, 56 parents/chaperones. * Show: "We're doing our parade sequence that starts with our fight song, 'Onward, Ringgold,' then 'Tiger Glory' and 'Georgia on My Mind.' We're doing a veterans salute to all branches of military service and closing with 'New York, New York.' If we time it right, we'll be playing 'New York, New York' as we pass the reviewing stand," said Christian. * Cost: $800, includes accommodations, meals except those on the road to and from New York, Rockettes Christmas show, Rockefeller Center, Museum of Natural History, dinner cruise. * Director's quote: "While Hurricane Sandy did not affect the parade route, as far as we know, it did change our daily itinerary a little bit. We had planned to go to Battery Park, and it is closed due to flooding, and we can't to Ellis Island, but we are taking a cruise around the harbor there." Christian said the Band Boosters are planning a collection of items to deliver to New York hurricane victims. "We can completely relate because we were in a similar situation two years ago with tornado damage. We hope to fill our band's semi-trailer and send it there in a week or two." * Appearance: One of four guest bands performing at the Southeastern United States Honor Band Clinic at Troy University on Feb. 2, 2013. * Show: "We are currently working on programming the music. We will perform a concert at the clinic, around 45 minutes of music," said Callaway. * Cost: Callaway said two fundraisers will be held to cover students' expenses. * Director's quote: "This is our first full concert invitation for the Wind Ensemble. We were chosen to perform a festival-style concert for the 2011 Loyola University Invitational Concert Festival in New Orleans. This honor comes from being selected from several high schools that applied to perform at the clinic," said Callaway. * Student: Asa Albritton, senior and tuba player at Ringgold High School. * Parents: Doug and Nancy Albritton of Ringgold, Ga.
* Honor: One of 125 musicians and color guard members nationwide invited to play in the U.S. Army All-American Marching Band on Jan. 5 in San Antonio, Texas, at the U.S. Army All-American Bowl. * Televised: Bowl is broadcast live on NBC. * Show: "Rhapsody in Red, White and Blue," a medley of patriotic songs. Chosen musicians were sent their music, which must be memorized before they arrive in Texas at the end of December. * Cost: All student expenses are paid. * School leadership: Albritton is tuba section leader in the Ringgold band, member of the wind symphony and jazz band, has been chosen for District 7 Honor Band four times and twice selected to Georgia All-State Band. He was selected for Governor's Honors School, is an Eagle Scout and a member of the Beta Club and National Honor Society. * College: Plans to attend Samford University in Birmingham, Ala., to major in pharmacy. * Director's quote: "Asa is one of those students that teachers dream of having," said band director Robin Christian. "He doesn't need any motivation; you can tell he has the internal desire to be the best he can be. He's a very accomplished musician because he really works all the time. He's respectful to his peers and teachers." * Area semifinalists: Six other area band students were named semifinalists in the selection process for the Army All-American Band. * Heritage High School (Ringgold, Ga.): Hunter Moreland and Rebekah Phelps. * Northwest Whitfield High School (Tunnel Hill, Ga.): Matthew Baker. * Bradley Central High School (Cleveland, Tenn.): Kelci Beavers, Jamey Critchfield and Michaela Kazy. As you read this, 130 musicians from Ringgold High School's band are warming up in New York City for their big gig this afternoon. The Ringgold students are making their second appearance in the New York City Veterans Day Parade, a prestigious bid that bands across the nation vie to receive. Ringgold is one of four area bands that has accepted notable invitations to appear at high-profile events. Not to blow their own horns, but their directors credit these invites to hard work by students, with long hours of practice, to build their bands' reputations as some of the best in the Southeast. Ooltewah High School's marching band is one of 24 bands in the nation invited to the McDonald's Thanksgiving Day Parade in Chicago. 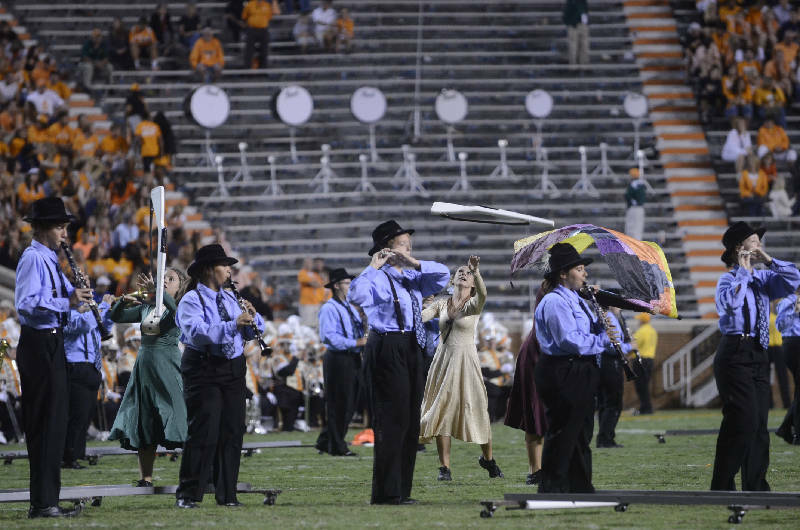 Walker Valley High's band will make its fourth appearance in London's New Year's Day Parade. Assistant director Colby Burris said the Charleston, Tenn., band has become known for its innovative shows, and the young musicians won't disappoint this year. Walker Valley is taking its "Gangnam Style" to Trafalgar Square. "There will be some choreography involved," Burris said. Heritage High School's wind ensemble will take its place in the spotlight in February at the Southeastern United States Honor Band Clinic. The Legion of Generals band is one of four guest bands chosen from numerous groups auditioning for the honor, according to director Blair Callaway. Last year, 3.5 million viewers tuned into the McDonald's Thanksgiving Day Parade's broadcast, according to its website, and the London New Year's Day Parade will be broadcast to 700 outlets, including CNN, Fox News and CBS, on Jan. 1. A tip of the shako to these young musicians serving as Tennessee Valley ambassadors to a worldwide audience.